The phrase originated from when farmers would herd cattle with metal pokers. The beasts would kick back against the sharp prods but would never reach their assailants and it would only result in further injury. The phrase is used in the New Testament to describe how resisting God would only result in suffering. This is the metaphor former second string quarterback Peyton Wilfley uses to describe his first season with the American River College Beavers football team in 2014. Since his final game at ARC in November, Wilfley has been accepted to Brigham Young University in Utah, where he now faces spring tryouts with a different mentality than the one he carried with him four years earlier as a college freshman. The nearly 6-foot, 200-pound athlete says he struggled with the transition from high school to junior college football in 2014 despite ARC’s 10-2 record that season. 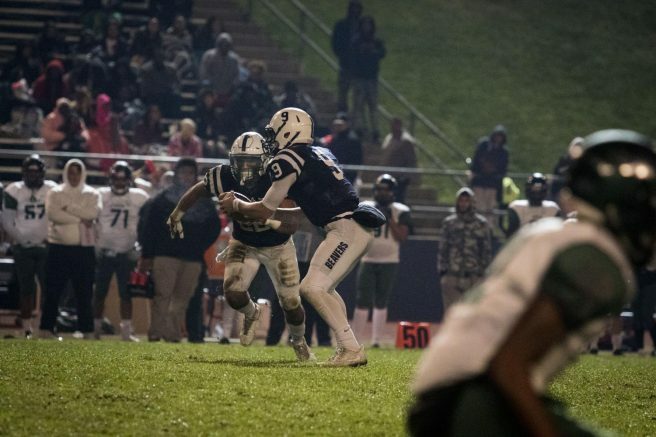 Only after his two-year mission in London, wholly focusing on his Mormon religion and serving others, did Peyton Wilfley learn to stop fighting against his coaches, his team, and himself. Wilfley started football in 2004, when he was 7, and says he played on the Oakmont Jr. Vikings Mighty Mites team with other prominent players like Golden State Bears linebacker Jordan Kunaszyk, University of Southern California linebacker Cameron Smith and Fresno State wide receiver Namani Parker. Wilfley continued to play through his time at Casa Roble High School and straight into community college. Wilfley is the youngest of five siblings and was raised in the Mormon faith. As the Elder’s Quorum President, Wilfley holds a higher position in his church. Wilfley says his coaches were understanding of his dedication to his faith and allowed him to skip Sunday runs so he could recognize the sabbath. Wilfley found support within his team as well, especially from those who he’s closest with. Michael Povey is a wide receiver for the Beavers and a long time friend of Wilfley’s. Povey has played with Wilfley since his sophomore year of high school at Casa Roble. He says they had a “stellar” season Wilfley’s senior year, but come his college freshman season, Povey believes Wilfley may have pushed too hard to play. “It’s huge because that is a two-year period of your time… and a very crucial moment, especially for a college football player. I don’t know why he rushed it.” Povey says. He argues that Wilfley might have been better off red-shirting his freshman year to save his eligibility. Instead of playing, Povey believes Wilfley could have just practiced with the team as a freshman and then played two consecutive seasons after his mission. “He was working against the grain… He pushed it, I really feel like he shouldn’t have, but it’s his decision,” Povey says. “I feel like he could have flourished if he had just let it breathe.”,” Povey says. Povey says Wilfley’s struggle in 2014 was apparent. He says Wilfley spent around half the season sharing time with another player. According to Wilfley, this was the first season he wasn’t starting and he struggled to watch the offence from the sidelines. “It was just a big mental block for me.” he says. Wilfley says he left ARC in 2015 feeling frustrated. He spent two years traveling to England, dedicated to teaching people about the gospel of Jesus Christ. Wilfley says that the two years of work suited him better and allowed him to understand and execute his purpose. When he returned, Wilfley found his position had been filled in his absence. Hunter Rodrigues played as starting quarterback for the majority of the 2017 season but playing second string allowed Wilfley to apply his new philosophy better. When he stepped in for Rodrigues during the San Mateo game on Sept. 30, Wilfley helped deliver the 21-20 win. The Beavers finished their 2017 season facing San Mateo again at the Northern California Football Conference championship game in November. A missed field goal sealed the fate of Wilfley’s community college career with a 24-21 loss. Months later, Wilfley reflects on what he’s brought with him from his time at ARC. Wilfley believes playing at ARC allowed him to learn hard lessons at a lower cost. Wilfley says he was met with resistance from the BYU coaches because of the large number of players trying out in March. “I met with the quarterback coach on the first day of school and he really tried to… dissuade me from trying out.” Wilfley says. Now Wilfley is focusing all of his efforts to fight for a spot on BYU’s team and an opportunity to utilize his newfound mentality. Wilfley has been throwing with an unofficial team at BYU and will be trying out for the quarterback position in March. Wilfley knows he will have to face a harsh reality in March. He will ether have to sacrifice his time and social life to play or give up the game that’s been a prominent aspect of his life since he was 7. Regardless of whether he plays, Wilfley says he intends to further his religious practice and to carry with him the realization that kicking against the pricks hurts more than putting his team before himself. 1 Comment on "Former ARC quarterback tries to make the jump to Division I"
I’ll be cheering for you, Peyton. May you get what you want out of this experience, trying out for the football team. good LUCK AND go Cougars!